CD review: "Jazz Christmas Party"
At least unlike their brethren in country/western, jazz musicians are hardly ever asked to do an entire album of Christmas music. Instead, the last few years just about every label with any jazz artists at all on its roster has trotted out a holiday compilation, with a bunch of musicians turning in one song each. 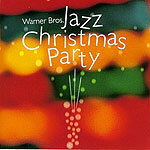 This year it's Warner Bros., and if it isn't as good as other jazz Christmas collections that's probably because Warner has so few top-notch jazz stars. And so while Joshua Redman's "Santa Claus is Coming to Town" swings and Al Jarreau turns in a warm and surprisingly sentimental reading of Kenny Loggins' "Celebrate Me Home," the listener is also forced to endure light popster Michael Franks doing his worst Bob Dorough imitation on "I Bought You a Plastic Star for Your Aluminum Tree." Which is part of the problem here  folks like Michael Franks and Bob James simply are not jazz musicians. They play easy listening music, which somehow got relabeled during the 1980s as "light jazz" or "smooth jazz." Much of what is on here is far closer to the Ray Conniff Singers than it is to anything remotely resembling jazz. So why call it jazz? Most of what's here (outside of the Michael Franks cut, which is annoying) is very pleasant and Christmasy. If you miss the old Perry Como Christmas specials, this is in the same vein.